seeing this makes me excited about this summer. my wife and i are traveling to rome and to siena for the palio. i'll probably lose my mind shooting. I don't believe I've seen a digital collage by you before. Woohoo! It's lovely and I like it even better because not only are they from your photos, but because it is a collage made up of your specific memories. 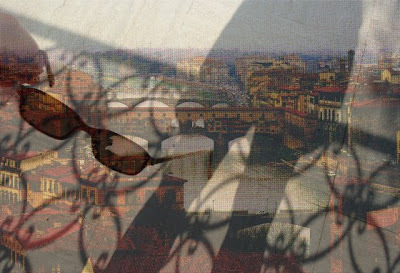 I've never been to Italy, but this collage gives me a sense of what that must have been like. I love the shadows on the balcony, and the floating sunglasses, it's a perfect personal touch for conveying la vida dulce. 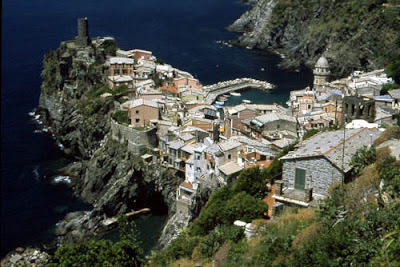 ( in my signature ) and to the blog where you can also vote the nicest of the Cinque Terre. Washed out like memories - still bright and sultry...exquisite lattice work. Bottom photo looks like a noble postcard - great shot. Great collage idea. I'm gonna steal it and no one can stop me. I did a "collage" kinda thing with some photos of my kids. I'll post them on my blog, if my kids give me their permission. Really wonderful collage, Andrea. I also enjoyed your story about your travels in Italy, especially to the Cinque Terre, which I am unfamiliar with. Now I need to check them out! I love Italy also and cannot wait to travel again. Ooh, I hope it's soon, to someplace wonderful! I left something for you on my blog today. I feel like I've travelled just from visiting here and being transported by your images. Thank you for your visit and humor and feel better wishes. How beautiful! I went to Italy for the second time in 2005. Visited family in my Mom's hometown of Controne and also got to go to Vietro and Amalfi. Such beauty... and, oh the food!! I dream of moving to Italy for good someday. We are committed to provide the clients highest standard of relocation or moving service in Pune at an attractive price. Looking for a professional packers and movers company? Do you live in Pune area? Then give us a call and let us take the stress out of moving.